An American stumbling upon the scene unaware of the significance of the day may mistake this enthusiastic crowd’s appearance as college or professional football fans. They come wearing their party’s colors: red/white/blue for the ARENA party; red for the FMLN; white and blue for the Unidad/Gana party. A more eccentric young couple even wear bright face paint and capes or carry party flags to show support for their candidate. Today is Sunday, February 2nd, Presidential Election Day in El Salvador. Our mini-bus filled with international observers waits outside the locked gate of the schoolyard at 4:20 A.M. – the first of two assigned locations for the day to poll watch. We are among 1800 poll watchers in the country. Stars and moon still shine brightly under the dark, chilly San Salvador morning. The sidewalk along the entire block is filled with emotionally charged, energetic poll workers eager to get inside the gate to begin setting up their tables for the long day ahead. Each party chants the rhymes of its individual political party. All are orderly. The volume is loud simply from the sheer number of party supporters. Yesterday we met these poll workers in order to become familiar with one another. We were with them the majority of the day which began with a raffle, a sure crowd pleaser. One lucky winner won a deluxe electric blender. Everyone was in a good mood, but soon the tone took on a more earnest, serious quality. The leader rallied the workers with an impassioned speech using powerful Biblical images. “Be strong against the enemy like the Old Testament reminds us in the story of David and Goliath.” The message is for those who want to remove the power from the reigning FMLN. “Send the message to the others,” he beseeches. 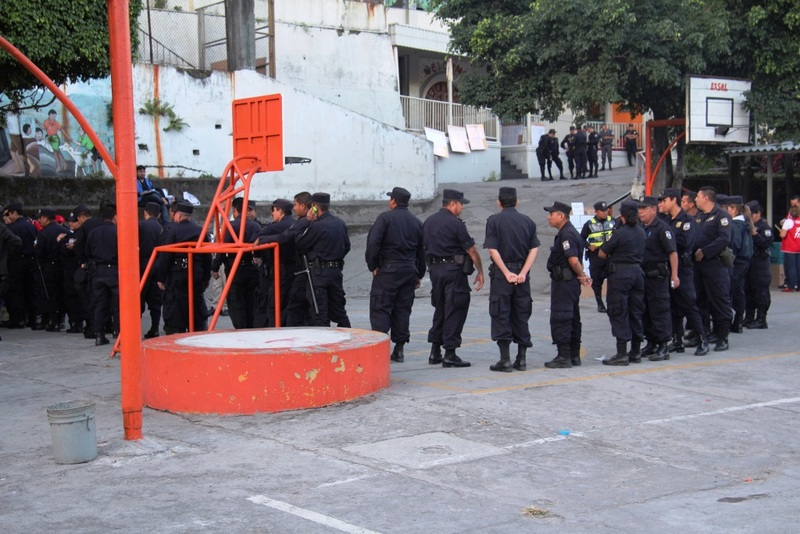 A particular concern is a rumor that the opposing party, ARENA, is paying citizens from Guatemala and Honduras to come vote using fake DUI cards – the IDs used in El Salvador which are required to vote. “We can’t let the enemy beat us by not paying attention. We must check EVERY DUI card carefully. Be attentive at your stations. Do not play with your cell phones. Even small bombs create big explosions. We cannot afford any cracks in our system.” We are told that losing 10 votes per voting station can cost the party the election. It will be close, and a majority is needed to win or else a re-vote will be taken on March 9th. Then it became our turn for a pep talk before we broke off into smaller groups for more specific information. The spokesman thanked us for our interest in the Salvadoran election process and encouraged us. “Your presence has a positive impact here. “ Voters are less likely to risk committing fraud or other violations when they see observers who can report them and cause serious repercussions. Applause thunders after each section of this leader’s well-organized speech. He really could be a politician himself. 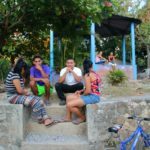 It should be no surprise that the Salvadorans show such fervent interest in exercising their right to vote. Following Spanish rule and oligarchies, they lived under military dictatorships for 30 years (December, 1931-October 1979) and then under U.S.- appointed presidents. They have a long history of living under fear, terror, and repression. It wasn’t until after the 1992 Peace Accords that citizens could vote. The first presidential election they voted in was 1994. Salvadoran presidents are elected every five years, and incumbents are not permitted to re-run. This 2014 election has three new exciting features. This is the first time that “residential” voting centers have been established. These basically are small local neighborhood polling sites. This decision increased the number of polling places from 400 to 1500. Prior to this, citizens would often need to travel long distances in order to vote. The hope is that these centers will encourage a higher percentage of voter turn-out. Another change is that police can vote for the first time. I thought my eyeballs would pop out of my head when a sea of black walked through our gates at 6:30 A.M. and came to one of MY assigned tables! Between 50-75 heavily-armed officers, smiling and eager, lined up to exercise their right to vote. The smiles certainly helped; if you are unfamiliar with the uniform of the Salvadoran police force, their attire can be very intimidating. They don black hats, black long-sleeved shirts and black pants tucked into their high black combat boots, and wear an arsenal of weapons on their bodies! Note: In their case, the officers are required to turn in their DUI cards for the day as a safeguard from returning to their home district to cast a second ballot. By the time the gates open and we get off the buses now at 4:30 A.M., wearing our well-identified observer vests, hats, and photo I.D. lanyards, we are divided up in pairs or trios – Spanish speakers with English speakers. We divide the turf, my trio is assigned six tables to monitor in what will be the hottest area of the playground. Ouch! Voting doesn’t officially begin until 7 A.M. and goes til 5 P.M. Vote counting can go until 10 P.M. There are 18 tables total scattered around the playground as well as in six adjacent classrooms. Each table has 500 ballots of eligible voters. 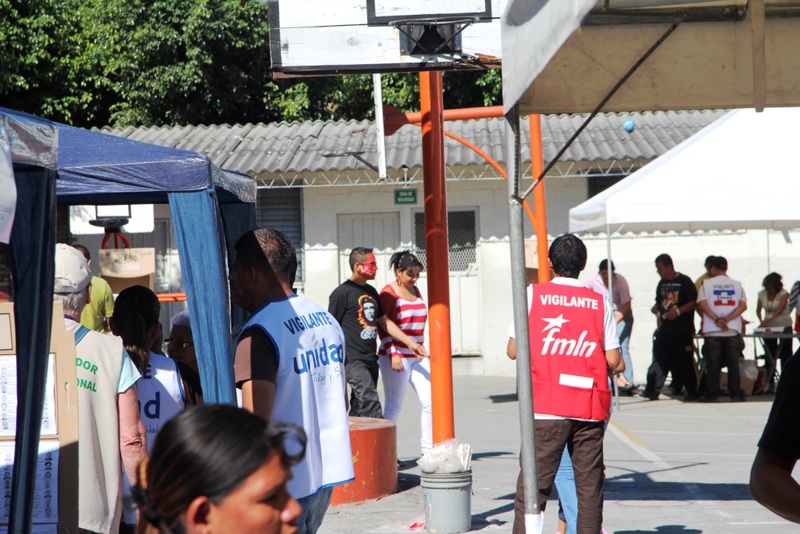 Around 8600 eligible voters reside in this location of San Salvador, a city of 2, 270,000. Although the materials for the ballot boxes arrive late, the day’s voting goes very smoothly with only a couple of minor incidents. What is impressive is the way in which the incidents are handled with no violence or even a hint of hostility. A team decision by the group of three members at the table is required when any confusion or disagreement occurs. There is a rule/law book in front of them to refer to for questions and clarification that arise, and they do! Sometimes negotiators are called in. A member of the attorney general’s office here floats from table to table. 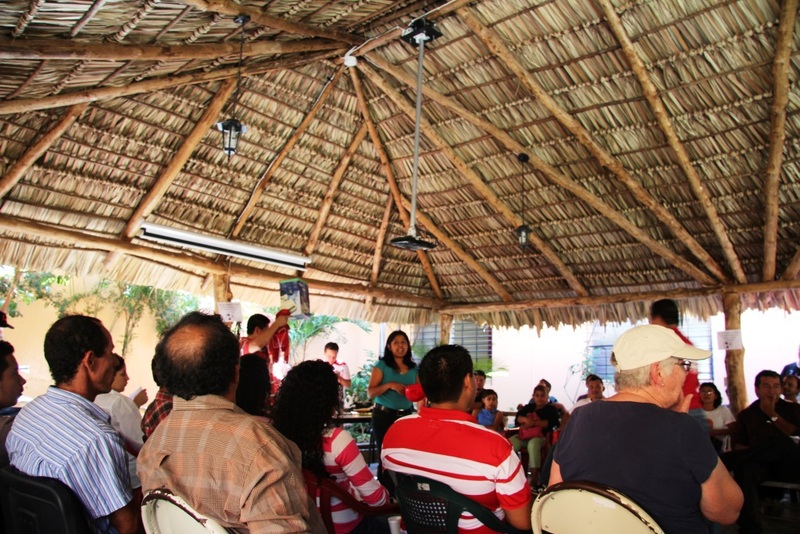 At one table before any voter comes to vote, the entire team which includes the three main players, and others who support them (without getting technical as to their names and functions), stand in a circle and prayerfully agree to respect one another’s differing views today and vow to handle situations diplomatically as a team without letting their own personal political persuasions interfere. When a disorderly woman slaps an armed police officer on the face, I hold my breath. He does not retaliate or get physical. Instead, a group of police form a semi-circle around her, gently moving her into a corner without touching her. This de-escalates her, and she voluntarily leaves the premises. Police are at all gates in groups checking bags and doing pat-downs. All are polite, helpful, and respectful. Entire families, from tiny nursing infants to the elderly, come to vote. Many, many handicapped accompanied by a family member come to vote. This broken concrete and steep ramp down into this area is not an easy terrain to negotiate for wheelchairs, canes, walkers, or the blind, but the impediments do not dampen their spirits. People tend to come and go leisurely without being rushed. They stop and talk with friends they know. If they need help, it is readily available. The voters seem genuinely pleased to be exercising their right to vote. Children enjoy spotting their parents and grandparents’ pictures on the tall cardboard placards displaying the DUI information. Today is a family outing. Like most Salvadoran events it is upbeat and festive. In some locations streets are shut off to traffic creating instant street fairs. Music plays; people mingle. Vendors outside the gates sell snacks of snow cones, candy, pretzels and chips. 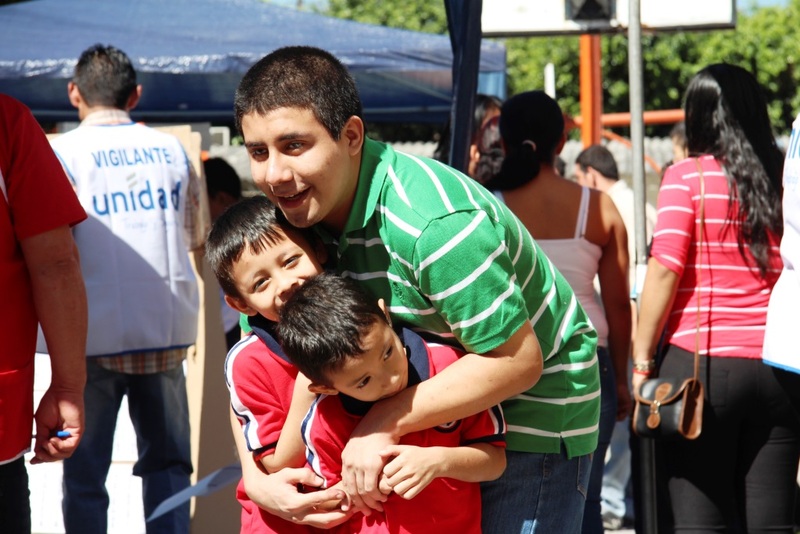 It is Presidential Election Day in El Salvador – a day to celebrate!